Sundal as this is usually called can be prepared with various kinds of legumes. Each day, one legume is used - Whole Moong - one of my favorite legumes. (In tamil we say pachai payaru)It is Nutritious and easy to digest. Healthy and tasty, This vella payaru sundal.prepared on navratri times and on auspicious occasion in South Indian Homes.This is also made as a sweet during Thottil Podal | Cradle Ceremony of newborn! 2. 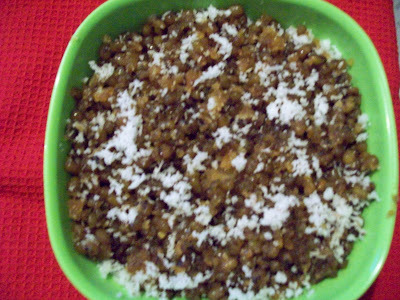 Mean time, Boil Jaggery with 1/2 cup of Water, Strain to remove dust and sand. 3. Make this into a thick syrup. Now add Cooked Moong, and stir well till water evaporates. 4. Now add, Grated Coconut, Elaichi powder ,ghee and stir well . serve hot or cold. 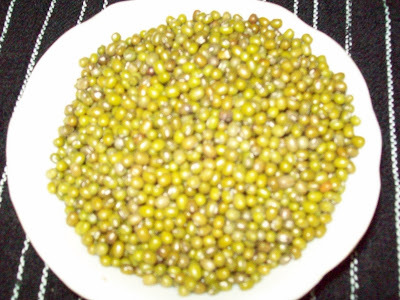 Green moong means the first thing comes to my mind is this recipe...I have tasted only once or twice,but have never made b4,thanx for posting!